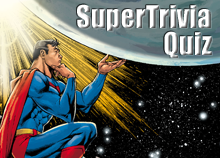 Welcome to the Superman Homepage SuperTrivia Quiz! This is a monthly competition, updated at the beginning of every month. For those who answer two, one or even none of the questions right, subscribe to the Big Blue Report newsletter to receive the answers via email. All submissions must be in before the 28th day of the month to be eligible. Under the Neverending Battlers list you'll find the Answers to last month's SuperTrivia questions. Question 1: In the "Supergirl" movie (1984) what name did Supergirl use for her secret identity on Earth? Question 2: In which comic book did Superman's cousin Supergirl make her first official appearance? Question 3: Can you name all four of Supergirl's parents (both biological and adoptive) in the TV series "Supergirl"? If you think you know the answers, simply type them in the spaces provided above! Complete the rest of the form below, and when you've finished click on the Submit button once. When the next set of "SuperTrivia" questions are put up (at the beginning of next month), look for your name in the Neverending Battlers list to see if you answered all the SuperTrivia questions right! Your submission must be in before the 28th day of the month to be eligible, as I update the questions and credit list at this time for the next month. Note: Steven Younis reserves the right to include or exclude submissions as he sees fit. Submissions without a correct email address will NOT be accepted. Those of you who didn't get all three questions right, or didn't happen to catch them, may want to check out what the answers to last month's SuperTrivia questions were! Subscribe to the Superman Homepage "Big Blue Report" Newsletter to find out when the SuperTrivia Quiz has been updated, and to see the answers to last month's SuperTrivia Quiz questions. Subscribe now! QUESTION 1: What substance can protect Superman from the effects of Kryptonite? QUESTION 2: What color Kryptonite caused Clark Kent to lose his inhibitions in the TV series "Smallville"? QUESTION 3: In which medium was Kryptonite first introduced? NOTES: 69 people answered all three questions correctly, 13 people got at least one question wrong.